If you're planning a trip to Orlando, Florida anytime soon, be sure to add SLATE Restaurant to your must visit list! It's a classic modern American restaurant boasting wood grilled cuisine and open air dining in the heart of the Dr. Phillips Neighborhood. 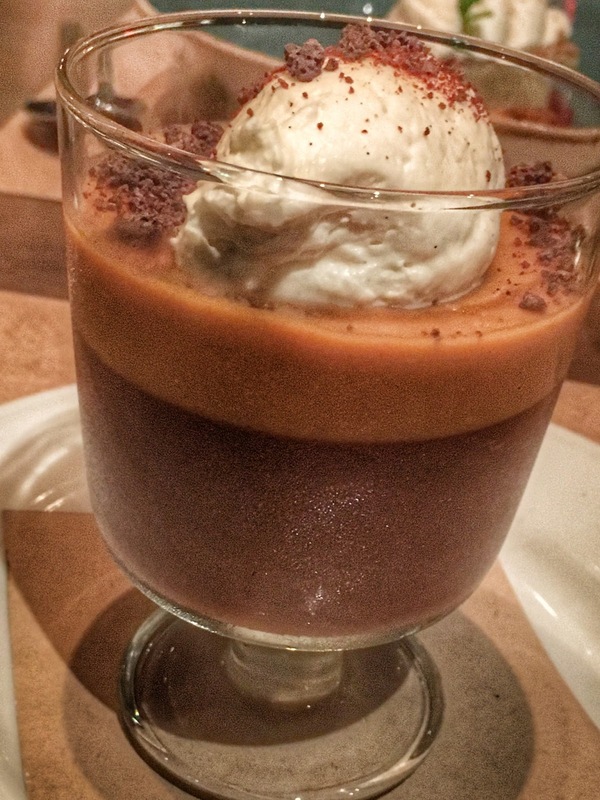 Just two short weeks ago I landed in sunny Orlando, Florida for the Food Wine Conference. Arriving a day ahead of the event, I was excited to spend time with some of my blogger friends. Face to face time, rather than screen time, which was simply amazing. You see, in the blogging world I have a lot of friends that I've grown quite close to but never had the opportunity to meet in person. We are like penpals in a way. 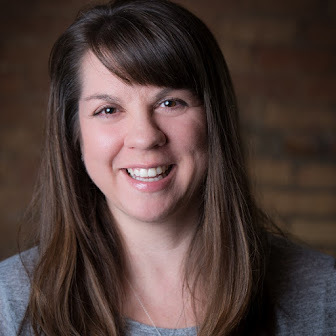 So when I had the opportunity to meet up with some of them pre-conference for dinner, I jumped at the chance. Shelby from Grumpy’s Honeybunch, Renee from Renee’s Kitchen Adventures, and Michele from Flavor Mosaic and I all headed to SLATE Orlando on Thursday for dinner. The restaurant is absolutely gorgeous. 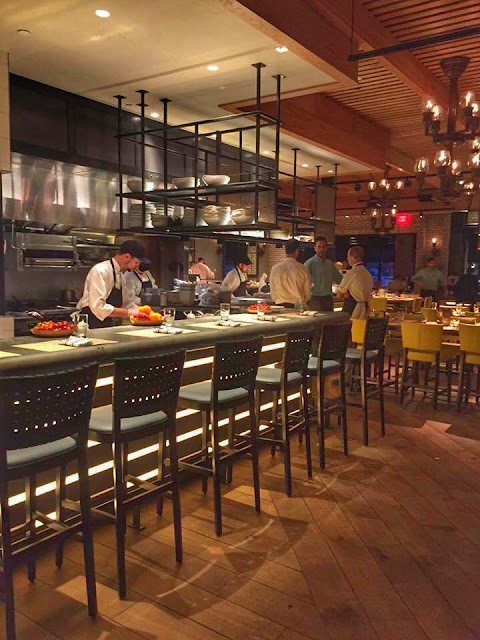 From the beautiful entrance to the restaurant to the open kitchen and stunning bar, it had such a warm and comforting feel to it. 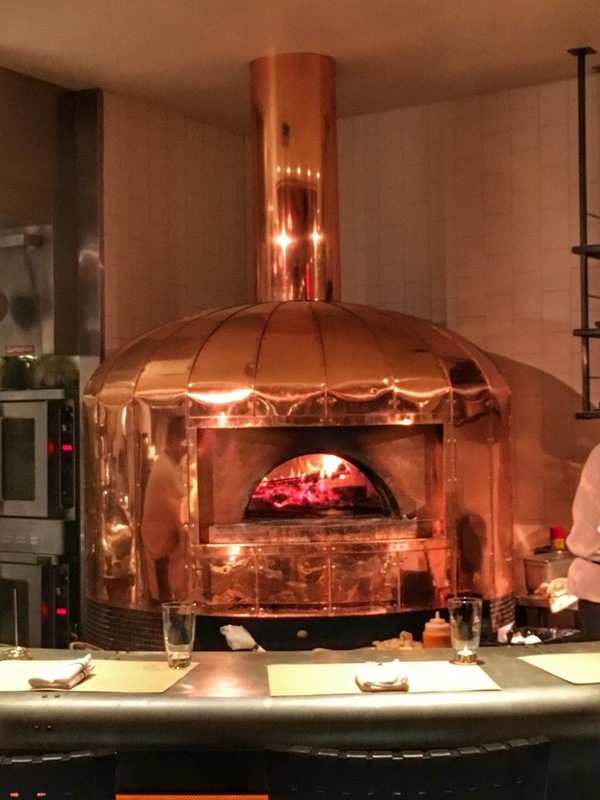 One of my favorite features of the restaurant was the gorgeous copper wood fired oven. What I wouldn't give to have one of those in my backyard! The booths were comfy and cozy, and perfect for quiet conversation. 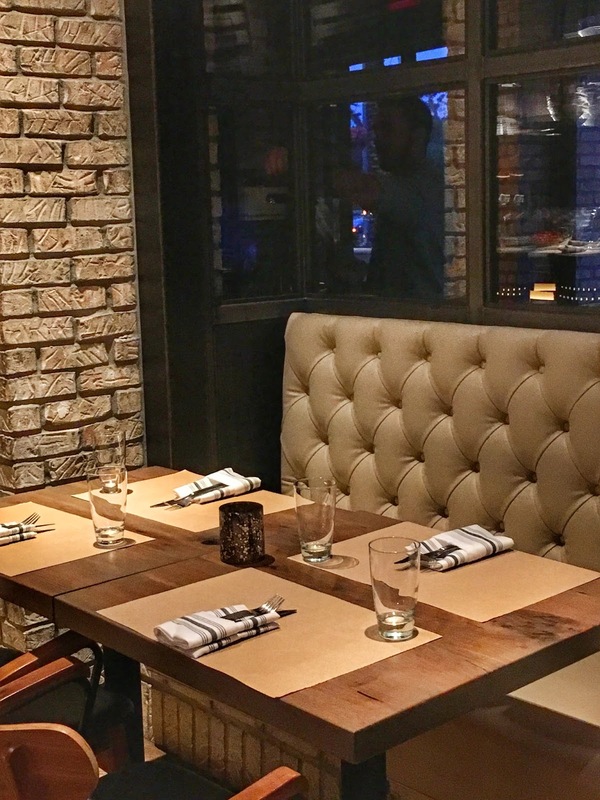 Whether dining alone or meeting friends for dinner, this is a perfect restaurant for everyone. 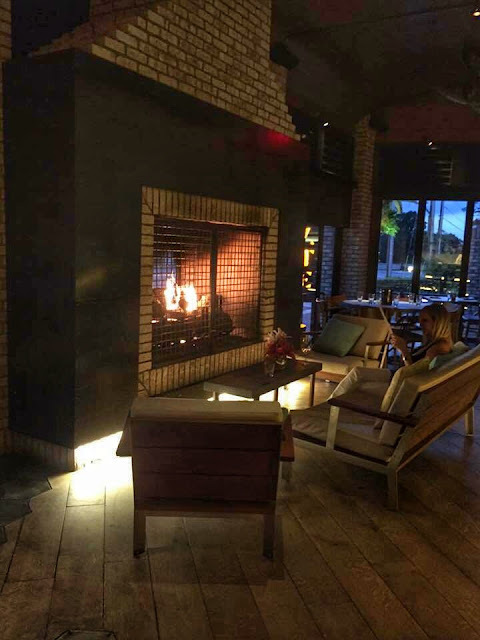 I also loved the gorgeous fireplace and sitting area, although it was so warm that night I didn't get a chance to sit by it. Of course we can't not talk about the food, can we? The food. Oh my the food! It was glorious. And I really mean that. Every single thing I tried was absolutely delicious. Luckily there were nine of us, so we ordered several appetizers to share. Boy was that a good idea! Being the cheese lover that I am, I couldn't wait to dig into the BURRATA with waterkist farms tomatoes, cucumber, olive oil croutons, and greek oregano. So creamy and delicious! And then there was the SWEET & SOUR CALAMARI with calabrian chili sauce. Did I ever tell you I hadn't ever tried calamari until like 2 years ago? Silly, silly me! Boy was I missing out. 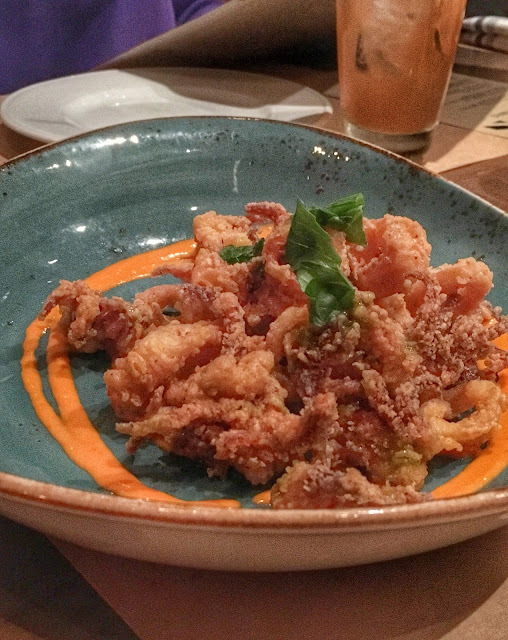 Calamari is good, but this calamari from SLATE is to die for! 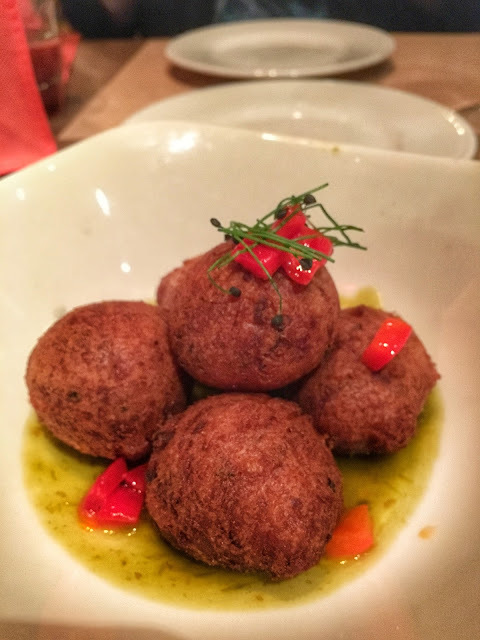 Then we've got these fun little PIMENTO CHEESE HUSH PUPPIES with jalapeno jelly. Adorable AND delicious! 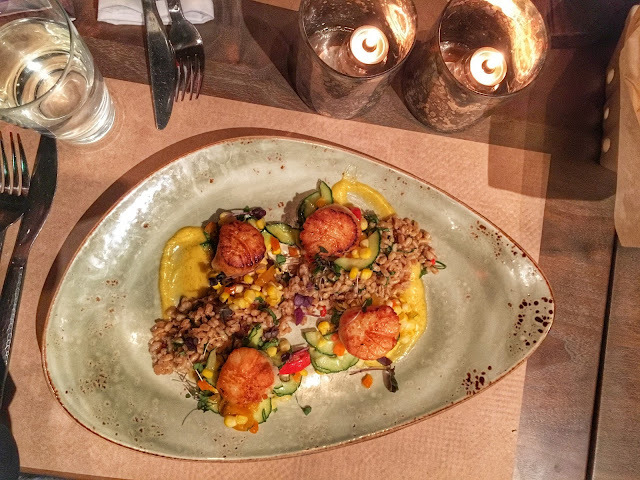 For the main course I chose the DIVER SCALLOPS with farro, zellwood corn, basil, cucumber, pickled peppers and Thai corn vinaigrette. One of the best dishes I've ever eaten in my life. And I totally mean it. The scallops were tender and flavorful, the sauce was light and spicy, the basil and cucumber so fresh. Just an amazing combination. Being the chocolate lover that I am, I just had to get the POT DE CREME with salted caramel and chocolate custard, creme fraiche chantilly, and crumbled chocolate biscotti. It. Was. Amazing. I was so full, but there was no way I could waste a drop of this! I ate the whole dish. 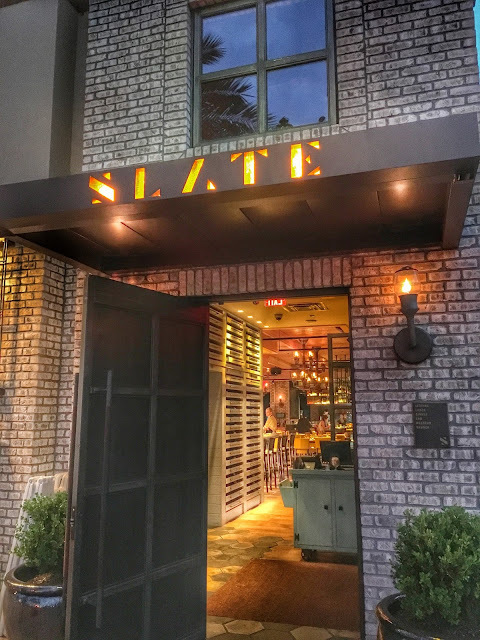 I had an absolutely incredible evening at SLATE Orlando, catching up and laughing with friends, enjoying amazing food and drink, all in a beautiful environment. What more could we ask for? I shared just a few of the items that I enjoyed during our dinner at SLATE. 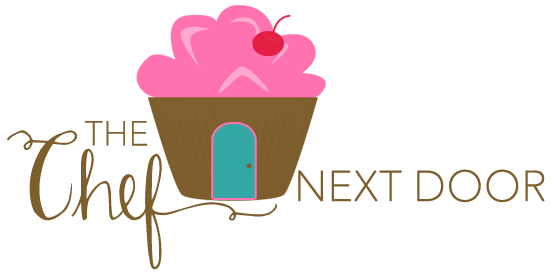 Be sure to visit Grumpy’s Honeybunch, Renee’s Kitchen Adventures, and Flavor Mosaic to see more delicious food and read their reviews! You can learn more about SLATE Orlando by visiting their website, or visit them on Facebook and Instagram. A HUGE thank you to Cory from Visit Orlando for arranging this amazing dinner! If you plan to visit Orlando soon, be sure to check out the Visit Orlando website to start planning your dream vacation. I received a complimentary meal courtesy of Visit Orlando in exchange for an honest review. All opinions, as always, are 100% my own.